silvieon4: Tasty Tuesday MAX guest blogger. In my prior letter I mentioned that one of the things I love the most about my new life is the home cooked food I get daily. Mhhh I do love it so. My person is really into "healthy" which is another one of those fancy words for delicious and fresh. And I love that we get to eat in different places. I have learned that when the big rainbow tray comes out, we are going to eat out on our balcony. "AL FRESCO". I thought that was some dude. Al. Fresco. It made sense to me. But, the grandma told me that it is Italian for in the fresh air... 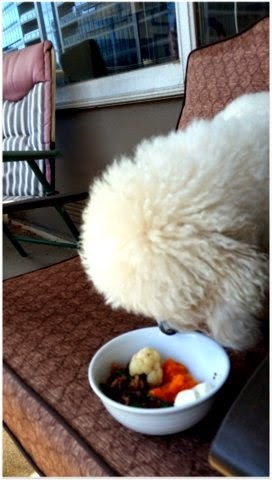 So eating outside= al fresco. Here is what Sunday breakfast looked like. See my person's food? 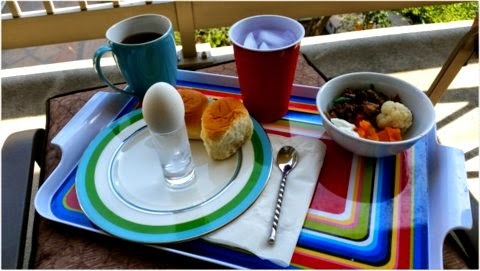 She gets the egg and the yellow breads and cup... See the bowl? THAT IS MINE. ALL MINE! Yogurt, cauliflower and sweet potato, turkey, duck gizzards and pork. ALL MINE! And yes that is me. I am admiring it all before I wolf it down. So what did you get for breakfast today? I ate on the patio. We were listening to the Louds. I have nicknamed them that. Momma calls them Cardinals. But they are so loud and so chirpy I just call them the Louds. I am getting ready to go out for a walk before the sun makes everything too hot. Oh yes, "fuzzy overlord" keep in mind that you only keep that title in your own jurisdiction. JD would quickly remind you as to who is the ultimate overlord. ME obviously. she who rules with a velvet paw. Your breakfast definitely out did ours!